On International Women’s Day, Claire Hughes, who leads Itad’s work on gender, reflects on the Voices for Change pathway to empowering young women in Nigeria. 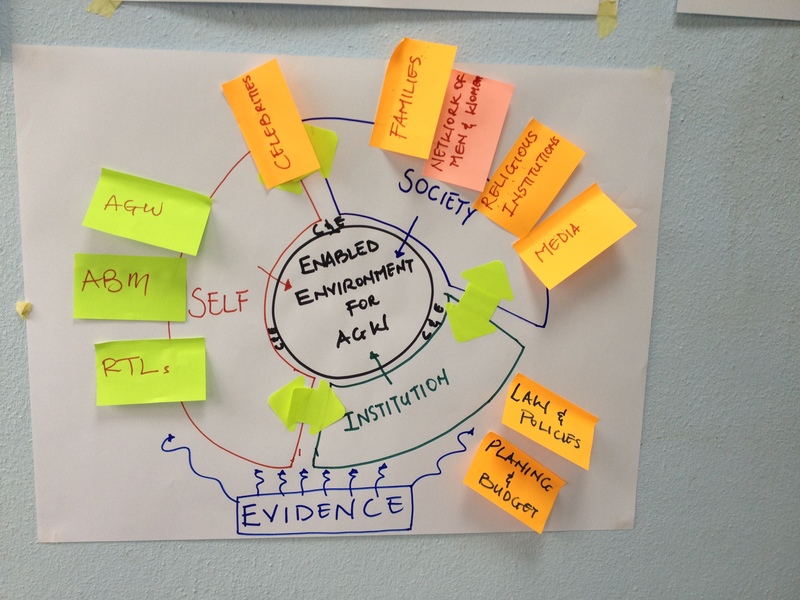 Last week I had the privilege of working with the Voices for Change project team on their theory of change. Itad is a core partner on this innovative 5 year DFID supported programme, which aims to strengthen the ‘enabling environment’ for young women’s empowerment in Nigeria and establish more equitable gender norms in relation to violence against women and girls, women’s leadership and decision-making. This is ambitious in most countries and no less so in Nigeria which ranks 152 in the gender inequality index. We are two years into the implementation of Voices for Change. This experience has given the team a deeper level of insight into the pathway for achieving our objectives. As a result, our rich discussions last week led us to evolve our theory of change (see photo) and create a vision of change which clearly resonates with the whole team. Voices for Change has always recognised that what young women are able to do is shaped not only by their own skills and confidence, but also by the attitudes and expectations of the community they live in and by the applied legal frameworks and policies. It understands that if a father’s aspiration for his daughter is that she marries and has children, then the chance of her getting a good education is more limited. Equally, if a state does not prohibit violence against women, then the likelihood of a woman facing domestic violence actually challenging that behaviour and seeking recourse is much diminished. The Self: We use an approach which, through reflection and peer discussion, encourages individuals to change their own gender attitudes and behaviours. We work not only with young women studying in tertiary institutions, but also with their male peers, and with key influencers in society such as religious and traditional leaders and prominent personalities. To increase our reach, the ‘I am Purple’ website (iampurple.ng) provides young women and men access to appealing information about gender equality and encourages debate on such issues. Society: Our approach to societal changes has two main strands. Firstly, we have created the Purple brand and use this in a variety of creative media to highlight inequalities between men and women, role model more equitable relations and have known personalities support and reinforce these new forms of behaviour. For a taster of our communications work, take a look at the ‘I am Purple’ website) where you can access our Purple Academy and listen to episodes of our popular Purple Tinz radio drama. Secondly, we support networks of champions for change – whether they be young men, women, women political leaders, religious or traditional leaders – so that they can drive change within their local communities by speaking out in support of gender equality and promoting equitable gender relations. Formal Institutions: There are three strands of work which aim to promote more gender equitable relations through formal institutions. Firstly, we are seeking the passage and enactment of legislation to protect women from violence and to promote equal opportunities at federal level and in selected states. Working with a number of partners, we have already recorded significant success here as the National Assembly passed the Violence Against Persons Prohibition Act in May 2015. Secondly, we are working with Federal Ministries, Departments and Agencies to increase the priority given to women and girls in policy and budgets. And thirdly, we are working with political parties to encourage women’s political leadership. Taking forward this innovative and broad approach is in itself no small undertaking. But our theory of change discussions last week highlighted again and again that for the scale of change required to bring about more equitable gender norms and with them a more supportive enabling environment for young women’s empowerment, interventions in each of these three domains must interconnect and mutually support each other. What is central to changing gender norms is that people receive consistent messages about more equitable relations between men and women from multiple sources and from sources that are trusted. Two years into implementation, we are starting to make some of these connections in our work, but intensifying these linkages is a major priority for our work going forward. The Voices of Change revised theory of change is an exciting vision for a more gender equitable Nigeria. Whilst early signs of change are encouraging, our theory does, of course, remain unproven. It is underpinned by theory generated internationally, but even this lacks a strong empirical base. And so, Voices for Change has another objective: to test the theory and to create a stronger evidence base on what works for strengthening the enabling environment for young women’s empowerment. 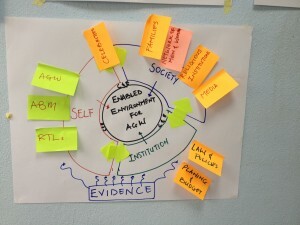 The more elaborated theory of change we developed last week is an important stepping stone for generating this evidence base. It will provide the framework for an evaluation we will conduct in 2017 to determine whether the theory holds true and how interventions in the three domains combine to generate results. In addition, over the next 12 months, we will be preparing a set of case studies, which capture significant results achieved by the project and unpack the causes of these changes and the contribution Voices for Change has made to them. We look forward to sharing these with you and to sharing more experiences from our ground-breaking work.